"telecommunications": from the Greek, meaning "communications at a distance". We use this term to mean communications of information represented in many ways: voice, data, graphics, images, video; in various formats: bytes, frames, packets;and communicated over various media: copper wires, fiber optics, the air, space. 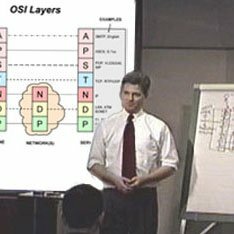 We are pleased to provide these free online telecommunications tutorials, based on our acclaimed telecommunications training seminars and courses. Click the links below to see available tutorials in each category. Copyright © telecommunications-tutorials.com All rights reserved.